Noah’s 11 months old in today’s video and we decided to try and let Noah self feed today. As you can see he really enjoyed it (as we did his mommy and daddy.) I thought I’d share a little bit about our experience with allowing Noah to self feed for the first time for any of you getting ready to try this with your child. When they start doing this with toys, they should be more than willing to do this with food. They should also be making some chewing movements with their mouth, they don’t need teeth, but they do need to know what to do with a more solid food. Teeth will determine the consistency of the foods you will try. If your little one does not have teeth yet you’ll want to stick to easily mashed items. It’ll also be easier if they are interested in what is on your plate while you are eating. Noah started grabbing our drinks and food which made me realize that maybe I needed to give him his own plate. Puffs are for those who have a great raking ability and more importantly a pincher grasp which typically develops around 9 months when children usually start eating more solid foods. The average age of a child with Down syndrome having a pincher grasp is 20 months. The reason I wrote the post on grasps is because I had just figured this stuff out and knew I would be referencing it now as I talk about feeding. Noah is still at a radial palmar grasp which makes puffs pretty hard to pick up. I had set him up for failure because I didn’t figure out his grasp prior to giving him foods. The book mentioned above has a great table matching grasp type with food choices. They recommend starting with large stick-shaped pieces of food. I started with bananas. They recommended making it look like an ice cream cone with the peel still on with the banana exposed at the top. Noah grabbed onto that, brought it right to his mouth and started gnawing on it. See…if I just put the right thing in his hand. Some other options are veggie straws which are basically tube-shaped puffs, larger pasta with a shape that is easy to grasp like rotini, or cutting long narrow pieces of bread. Using long pieces allows the child to hold an object with an edible section exposed that can easily be put in the mouth. Compare this to the puff which gets hidden in the hand and has to actually be released into the mouth. The teething crackers, such as the ones we are using in the video, are also great as they dissolve easily and stick out of the hand since they are fairly large. Animal cookies are always a favorite. You can get smaller and smaller as the grasp develops to where some day instead of your child picking up a clump of rice, he is picking up the individual grains. I did not rely on Noah to get all of his intake from self-feeding alone. I would give him some things to play with as give him meals by spoon feeding in combination with milk. As he starts getting better I will stop giving him things off a spoon as much. You need to have a balance, and it may take a while before your child is able to eat enough on their own. This is ok. The whole point at the beginning to to be exploring not necessarily providing nutrition. Your child will gag. They are supposed to gag. You want them to gag. It will scare you. You may have your hand on the phone for 911 before you realize that your child is ok. Gagging is not the same thing as choking. Choking cuts off the air supply where as gagging gets a chunk of food out of the back of the throat so that it can get worked on some more. With choking you will not hear many sounds from your child and they will likely be changing colors, now is the time you want to shout “Annie, Annie are you ok?”, get your child out of their chair, put them over your knee and give them 5 back slaps to help get that item out as well as call 911. I thought that letting Noah self feed would speed up the feeding process…I was very wrong. It has slowed it down, but that’s ok.
Noah eats his meals with us as usual, and I try to give him whatever we are eating plus or minus a few things. He likes to shovel the food in so we have to place it in front of him slowly. It is great to share eating times together and has finally brought my husband and I to the dinning room table rather than eating in front of the tv. I know that several children with Down syndrome have problems with textures in their mouth. Your OT or ST should be helping with these issues. I encourage you to offer as many different textures as you can. Also try all sorts of different fruits and vegetables so that your child gets used to eating them. It can take something like 7 exposures to a food before a child will accept it as something they will eat. I find parents often just give the child what they know they will eat rather than branching out and trying new things. What foods did you try with your child first? What were you afraid of most? What challenges have you faced with feeding? Great post from Dr Mom 🙂 – is that an opportunist doggy friend in the footage hoping that Noah doesnt learn the art of self-feeding too quickly!! The funny thing is Noah and the doggy (Gizmo) have already become “partners.” Noah’s learned the dog will be his best friend if only he’ll lower his hand at give him a little yummy treat. ha,ha.. This was a great post and I wished I had it when I started feeding James. I was so scared. Even though he is my 4th child, I felt like I did not have a clue. James loves to feed himself. He has only 1 tooth at 14 months so we are still limited a bit by what he can eat. But he loves eggs, mac and cheese, mandarin oranges, bananas, grilled cheese. I love mandarin oranges as an option too. We haven’t tried a grilled cheese…we might have to do that for lunch today. Thanks guys! Awesome timing for us . . . We are just 9 months behind you all and super thankful for your site and info. As baby Noah blazes the trail ahead of us you have continually been one of the best resources we have found 🙂 We have been “swiping” puffs onto the floor for a few weeks now which while tons of fun provides little self feeding success . .. and the gagging thing was freaking me out. Looking forward to trying some new ideas! I hope they work!! Gagging will always freak you out, but it does get easier to let them try to get the food out of their throat before slapping their back 🙂 Let us know how it goes. 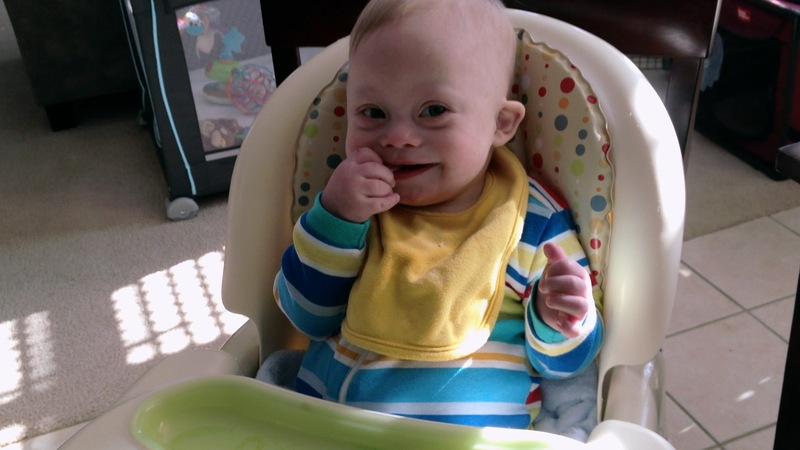 My little guy, who has Down syndrome, will be 11 months in a couple days and we are doing Baby led solids with him too. we started once he seemed ready at almost 9 months. He has no significant delays so far so he was sitting well and reaching for everything. His therapy team is amazed how well he is doing. It is amazing what these kids will do if you just give them the chance! I agree. So glad to hear he is doing well!! Any tips on self feeding? abby i strip aimee down to diaper only n i got old sheets n made a poncho like thing to put on her it covers all of her . and for the floor i use the other sheet in the set . so all i have to do is toss them in the trash if to messy or in the washer .. she loves puffs n bananas i cut up into slices i havent tried apples .she loves eng peas too she squishes them then licks her fingers . i learned also the hard way to put on one of her hats to protect the hair cuss some how the fingers find their way to the hair every time .lol thanks ofr the video . Great article–Thank you for the great suggestions. My little guy (9.5 months) is ready to self feed, but I have only given him puffs for self feeding. The poor little guy just can’t get those darn things into his mouth! I will try some of your other suggestions. I totally forgot about the pincer grasp often being delayed. Thank you! I’m sure my little man will thank you too! Thanks so much! Our Janie is 5 months now and is still just getting breastmilk from a bottle, but I trust that we will be venturing into other foods soon. She’s bringing toys to her mouth constantly and sucking and biting on her thumb, fingers, and anything that gets near her mouth! Our OT and ST said we needed to wait until she was sitting until we tried any solids. I will look into the feeding chair you mention above and see if that’s an option for us. The pediatrician in me is going to come and recommend waiting until 6 months 🙂 which is because of food allergy stuff. we used our carseat initially for feeding the once Noah was sitting better went to that chair as it reclined. Your therapist may have great recommendations. My Otto is just 7 months. We are having constipation issues…so we are going slow with the feeding. I’m pureeing as many veggies as I think he might eat adding textures slowly. He loves acorn squash, pears with goat’s milk yogurt, carrots and peas…and everything else he tolerates. I need to get him some more avocado to keep things moving. Or mango. The blueberries worked too. I love to make him food and then stick it in my ice cube trays and freeze it. Then stick it in a baggie and label it. So much better than canned food! I think we are a year behind you so thanks for all your tricks & tips! I liked making my own purees until I got to meats and got grossed out 🙂 We have constipation issues as well, but since starting more veggies and fruits it has gotten a lot better. Thanks for this post. Our little boy with DS is doing so great in so many areas at 23 months (walking, saying a few words) but he does not self feed. He furthermore doesn’t even like to eat “table” foods. His diet is entirely baby food. As soon as he puts a piece of table food in his month – say, for instance, a banana, his long tongue goes crazy and he forces the food out of his mouth with it. If something does get to his throat, he gags a lot. We’ve been giving him time to try and self feed every day at lunch time, but he hasn’t made a lot of progress recently. He just “spits” the food out with his tongue every time. Of course we’ll keep trying, and eventually he should get it! Funny you mention that — we actually have tried that recently with apple sauce, and it worked pretty well. Of course he was a mess, but he put some in his mouth. I guess we are wondering how to get him to even eat “table” foods, even without self feeding. He pushes all that food out of his mouth with his tongue immediately. Our OT hasn’t been much help. We are considering finding a specialist. I would. I would probably go to a speech therapist who has a bit more training in this area. Usually speech therapist focus on either feeding or language so you will just have to ask if they feel comfortable with feeding. Thanks so much for the info. Elias is only 3 months right now but I know I’ll desperately need the advice of those who have gone before. I’m sure life is busy for you so thanks for taking the time to post this info. It is hard! That is why we are so behind. Your husband sounds like my husband 🙂 I am glad you are having good luck with therapies and such. Let us know how the surgery goes. THAT IS A GREAT IDEA!!! I am going to do this today. Self-feeding was a real challenge for my son, but we are finally making some great progress at 18 months. Judah’s challenges were 1) no teeth until 13 months and 2) not having the pincer grasp thing down. He also LOVES eating, so he will cram a lot of food in his mouth if offered larger pieces (which were easier to grab). Straw shaped food such as sweet potato fries was easiest for him to grab first. This website has a lot of good suggestions for baby food and finger foods: http://wholesomebabyfood.momtastic.com/babyfingerfood.htm. On this page in particular we have made a lot of the apple/turkey sticks and the banana pancakes. Somewhere on the site is also an idea for “rice balls” which is basically rice put into a food processor until it becomes sticky, and then I added ground chicken and pureed vegetables. They are easy to pick up and to chew. Now that he has developed the pincer grasp he’s able to eat things like halved blueberries, peas, and cheerios. Hope this helps somebody! Informative post. One awesome benefit to self feeding is that it frees up Mom or Dad to clean up dishes quickly or eat your own meal all at one time. One thought about the apple – I always starting by putting apple or peach in one of those baby “net” feeders. Love the suggestion about the banana. That is what I frequently have started with. Also very cooked carrots – get mushy and chunkier to pick up than those puffs. The way I taught Noah how to drink from a straw was using just a regular old juice box. I know the straw is small (however your child hopefully has normal tone unlike Noah). The bend in the straw allows for it to rest against the tongue which should trigger sucking and then you are able to squeeze juice in the mouth. Noah rarely gets juice, so he thought it was awesome and wanted to figure out how to get more. Thanks for this post. My son is 10 months and eats really well but I have given up too easily with self feeding and I know I need to start on it again as that is the only way he will learn. This has given me some great ideas! Thanks for the post!! I guess because physically, Easton is smaller than the typical 8.5 month old, I didn’t think he would be ready for puffs or food with more texture. But during a visit to his pediatrician, we were encouraged to try more foods, puffs, and even table food if he didn’t like the baby food. Well what do ya know?! He LOVES puffs! He has the racking down, but still hasn’t figured out how to open his hand to get it in his mouth. So, we cheat a little. If I place the puff between his thumb and index finger, he can get it right into his mouth with no problem! He also loves the cheddar puffs (glorified baby cheetos), and teething crackers. 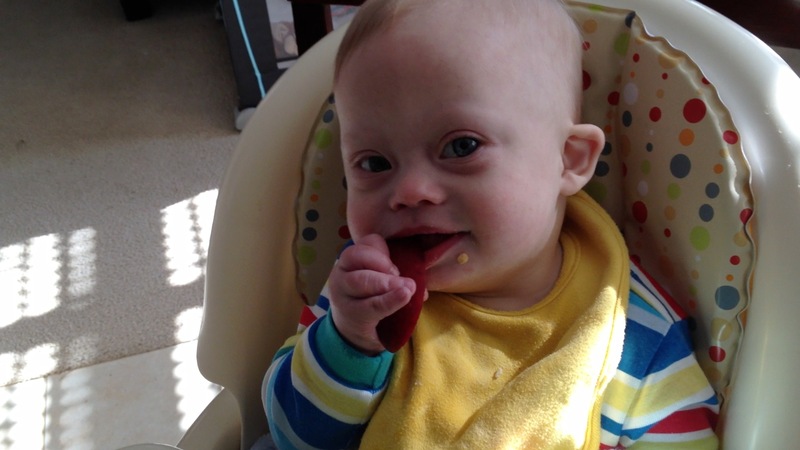 We still don’t have much luck with baby food…he thinks this is the BEST time to show off his raspberry skills. We haven’t given up, though. We will find what he likes. I also requested that ECI get a speech therapist out for an evaluation. I hope she has some suggestions for us. Until then, I will continue having baby food speckled clothing, and he will continue enjoying his puffs! owing to the chance of miscarriage wit the invasive test. They were quite laid back about the fact the second one may have DS and said if he did have it so what. I thought the stigma of having a D S baby had long gone. None of the D S Parent’s I have got to know through my grandson are not worried about the D S itself only worried if they have serious medical problems. A Dad called John Blackwood posted a video a while back in which he said parents were pressurised to have them aborted. His wife was carrying non identical twins and they were still pressured but not believing in abortion refused. Is this common practice in America as it is not in the UK. Parents get the option but are left to make their own decision without and pressure. I really enjoy your reassuring approach to feeding! Because I work in early intervention, I would like to suggest to parents that speech & occupational therapists are not the only specialists available to help with feeding. In my office there are nurses with a lot of training/experience as well as developmental specialists, in addition to ST & OT. I’ve never heard of a nurse helping a child with feeding issues, can you tell me more about that. Also tell me more about a developmental specialist. Why would a parent go to one of these instead of a OT / ST? Just curious the difference and benefit of one vs the other. I am very much in favor of baby led weaning and used it successfully with my first baby. One of the “rules” of baby led weaning is that you don’t put anything in the babies mouth, they do it all. My second baby is 10 months old and has DS. He is doing great with purees but I desperately want to do baby led weaning. Would you wait to give table food until he can do it on his own or would you experiment by helping him put it in his mouth? My other question is regarding the gagging. My first child did some gagging and vomiting but it didn’t seem to bother her in the least. I am a little more reluctant to let my baby with DS go through the gagging and vomiting because I don’t want it to become a negative experience. Any thoughts? Thanks so much!